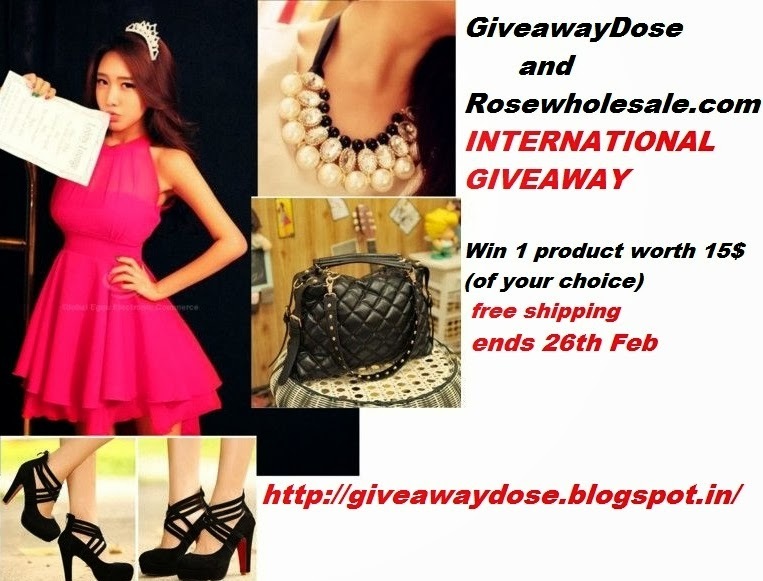 Giveaway dose: Win a product worth 15$ from Rosewholesale.com with free shipping. Win a product worth 15$ from Rosewholesale.com with free shipping. Rosewholesale.com is a leading international online fashion clothing store. Focusing on the very latest in affordable fashion style, both attire and accessories, they provide thousands of the latest in chic product lines, to give maximum choice to their clients with an extensive range of high quality, trendy fashion clothing – not only at the lowest prices, but also with a professional dedicated service to their valued customers from all over the world. 2. Style like you’ve never seen: New and exciting products are sourced and added daily on Rosewholesale.com. 3. Customer Understanding:innovative marketing department constantly researches the very latest in popular fashion clothing and accessories to satisfy the diverse demand of global customer base. Ok now coming back to the giveaway !! you just need to fill up the below Raffle-copter widget. do enter with as many entries as possible and increase your probability of winning . ALL the best everyone !! Wow! I love your giveaway. Ever girl's must have shoe. thanks for amazing contest Prena. Follow you at GFC, Bloglovin, Pinterest and Lookbook.